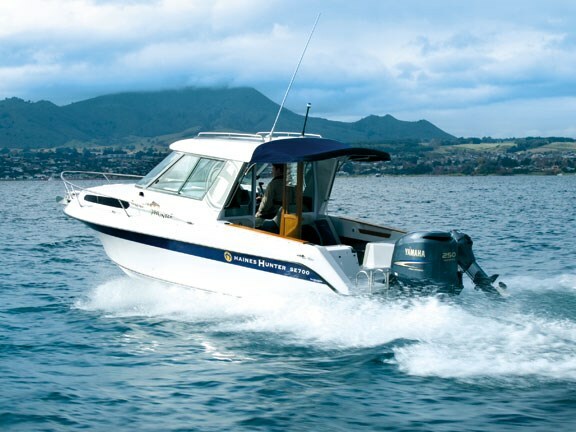 Two Haines Hunters from the brand’s legendary 700 series were available for our lake test, both owned by Taupo locals. Bryan Dalton has put great effort into setting the Ngarie D II up for his passion – trout fishing. 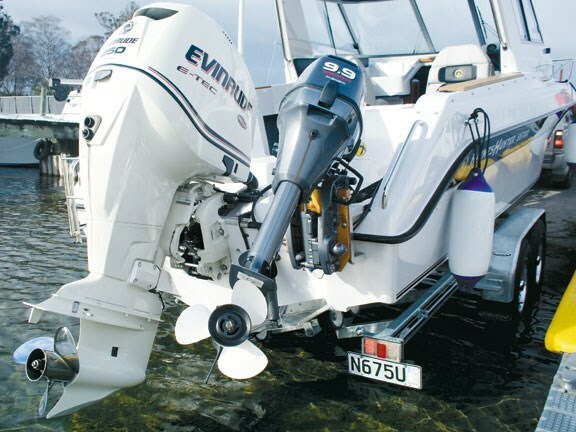 She is a Haines Hunter SS700, which is the open hard top version, powered by a Evinrude eTech outboard. The other boat we tested was the Rainbow Hunter, a SE700 version with an enclosed hardtop powered by a 250hp Yamaha six-cylinder four-stroke outboard. Bryan said the SS700 is the right trout fishing boat for him because there is plenty of space to swing a rod without hitting your mate or the boat. The SS700’s large cockpit and clear sides are ideal. Secondly, Bryan said the boat is warm. The cabin of the SS700 provides more than adequate shelter from the elements while still keeping the fishing gear at close reach. 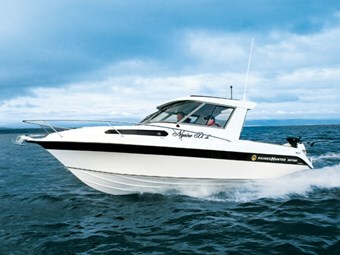 Another requirement specific to fishing on Lake Taupo is the boat’s ability to handle the conditions. It’s a big lake that allows for plenty of fetch and serious chop on some icy cold days. Compounding the chop is the fact that fresh water is denser than saltwater, so an equivalent wave on the lake packs considerably more punch. Other features Bryan likes on his boat is the quality of the Lowrance sounder, the excellent electric downrigger installation that can be quickly removed for jig or fly fishing, the auxiliary trolling motor installation remotely operated from the helm station, and the fact that his wife, Ngaire D, absolutely loves the boat. Both these vessels are damn good looking boats. The finish and decal work is first-class and I like the use of teak on the comings. The storage is excellent, and when you look behind the cupboards and bulkheads you notice that the workmanship is of a very high standard. There is no glass fibre lying around and all the wiring and plumbing work has been well installed and fixed in a tradesman-like manner. The Ngarie D II has a toilet installed forward in a nicely upholstered and private cabin. 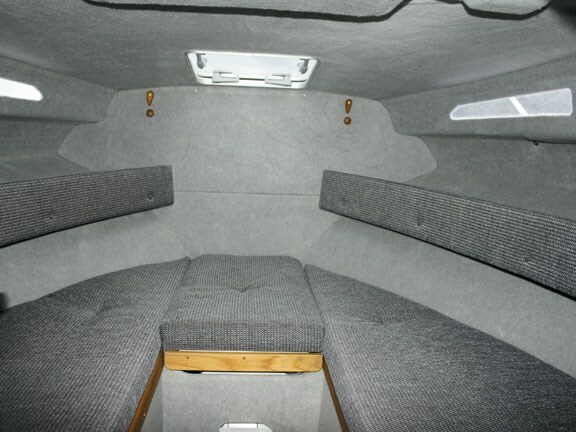 The deluxe back-to-back seats look good and are very comfortable. I loved the recessed fish bin holders in the transom that hide behind padded squabs, which are great to lean on while fishing. 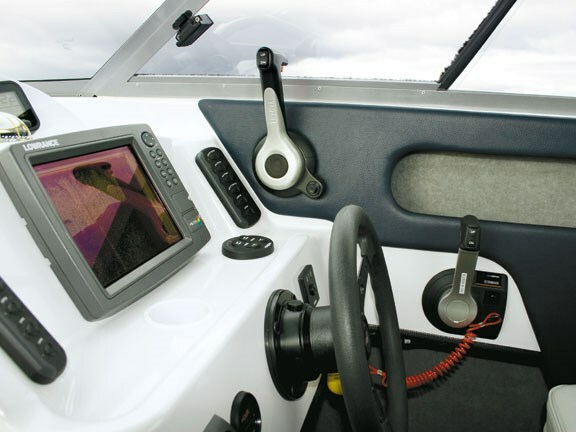 These boats have too many features and optional extras for me to list here, including the fully powered remote operated Lewmar anchor deployment system, so I recommend a visit to the Haines Hunter website or a talk to a dealer. Haines Hunter’s motto is "the secret’s in the ride", and having been on several boats from the Haines Hunter fleet I know the motto is deserved. There is a saying in power boat circles that the American answer to speed is horsepower. 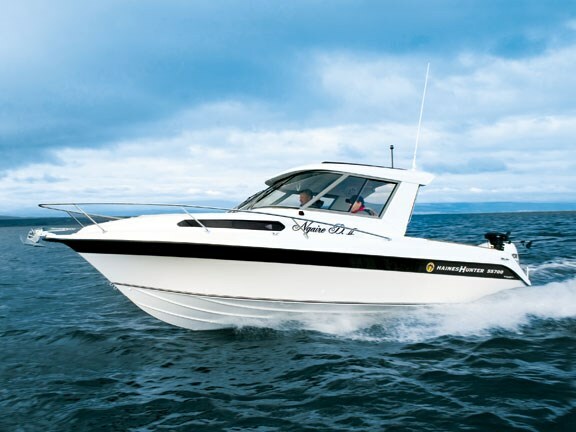 This came from the tendency of some New Zealand boat builders to build fast boats that require little horsepower. They achieve this by designing hulls that are light, but the major sacrifice is the ride. Americans, on the other hand, often build heavy boats that ride beautifully but require loads of horsepower to get up and boogie. With a towing weight of 2380kg, Haines Hunter has found a nice compromise. I still like horsepower and the 250hp outboards tested here definitely delivered the goods. Both boats roared out of the hole and took off. Pushing the hammer down and trimming out produced a fraction under 40 knots on both vessels and the ride was akin to being in a quality large car – smooth and predictable. Trimming the engines down and pushing into the turns felt great. These boats just drive through the corners, and as the speed bled off the turning circle got tighter and tighter with no real indication of any cavitation. The delivery of power to water was excellent and highly responsive. I also enjoyed the feel of the BRP throttle control system – exceptionally smooth but with enough built-in resistance to give a nice feeling of control. At 3700rpm we were doing 23 knots using only 34L per hour. Pushing the boat up to 4800rpm, we were doing a pretty impressive 35 knots and using only a fraction over 51L per hour. Those are good numbers on what is a reasonably heavy boat built for its ride rather than its speed. 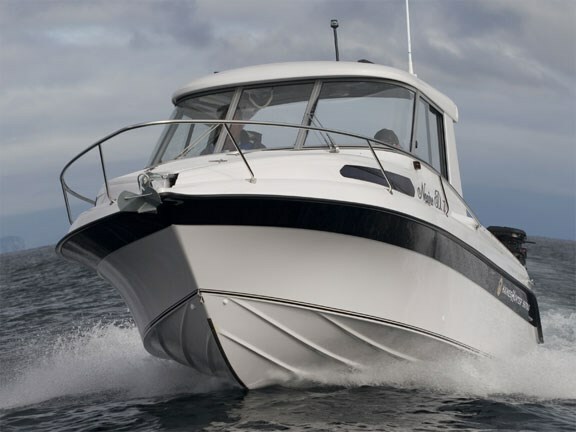 The enclosed hardtop feature allows for genuine all-season boat use. Not only does it keep out the cold but it does a great job of cutting out the noise – not that there is much with the impressive Yamaha V6 powerplant. Furthermore, the folding varnished doors look the part and the electric windows are really sharp. 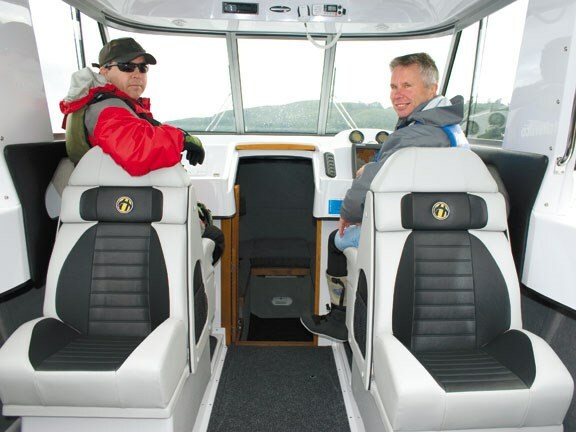 The boats speak for themselves and are testament to the quality of the Haines Hunter brand: well finished, spacious, comfortable and particularly well suited to all-season fishing. All boats from the Haines Hunter stable that I have experienced have a ride that puts them well up in their class. The Haines Hunter 660 is probably the most popular in the range and is also well worth consideration. See Haines Hunter boats for sale.